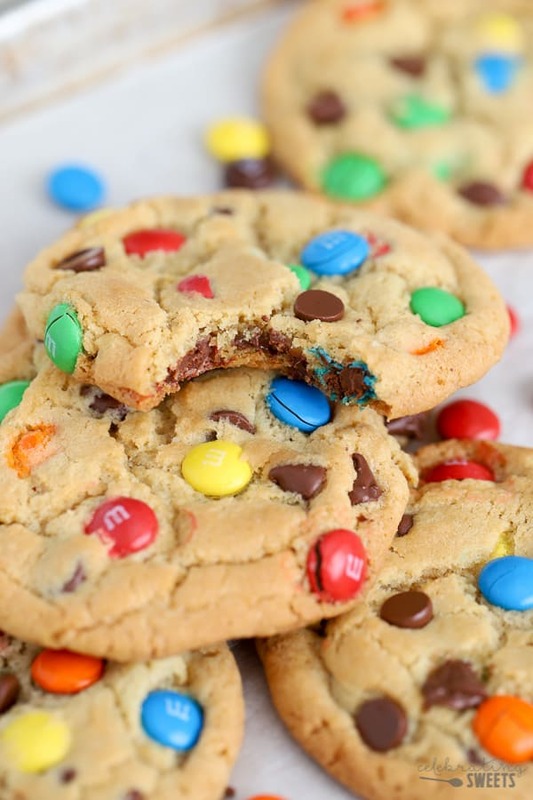 The BEST Soft and Chewy M&M Cookies. Crisp chewy edges, soft centers and loaded with M&M’s. 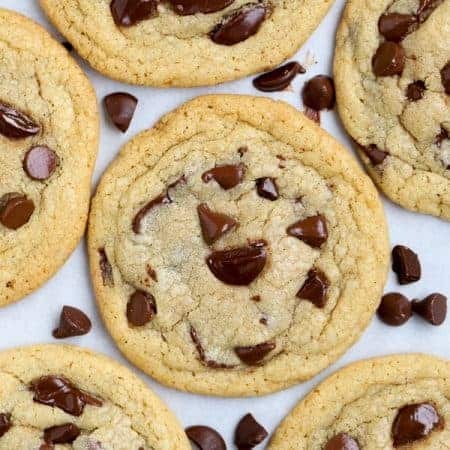 No chill time – you can be diving into these crazy-delicious cookies in minutes! RECIPE VIDEO BELOW! M&M COOKIES! This is the recipe that helped this site take-off several years ago. It’s a recipe I have made dozens and dozens of times. It’s my moms #1 go-to cookie recipe (hi, mom!). It has become a Pinterest favorite, reader favorite and family favorite for good reason – because these cookies are dang delicious! Have I sold ya yet? If you like cookies with crisp edges and soft centers these are the cookies are for you! I have perfected this recipe (and in the process consumed an unfathomable number of cookies). I have tips for helping them come out PERFECT! Prefer a THICKER COOKIE? THINNER COOKIE? Extra chocolate? Read on, friends! Make the dough by beating butter with granulated sugar and brown sugar. The brown sugar will impart moisture, sweetness and chew. Beat these ingredients for 2 minutes, until light and fluffy! Add an egg and plenty of vanilla extract – 2 whole teaspoons. Now your mix-ins get added. Stir in M&M’s or a combination of M&M’s and chocolate chips. Scoop the cookie dough into balls (big or small, see more on that below). Press some additonal M&M’s on those dough balls and bake! Pull the baking sheets from the oven when the cookies are set around the edges, but still under baked in the center. 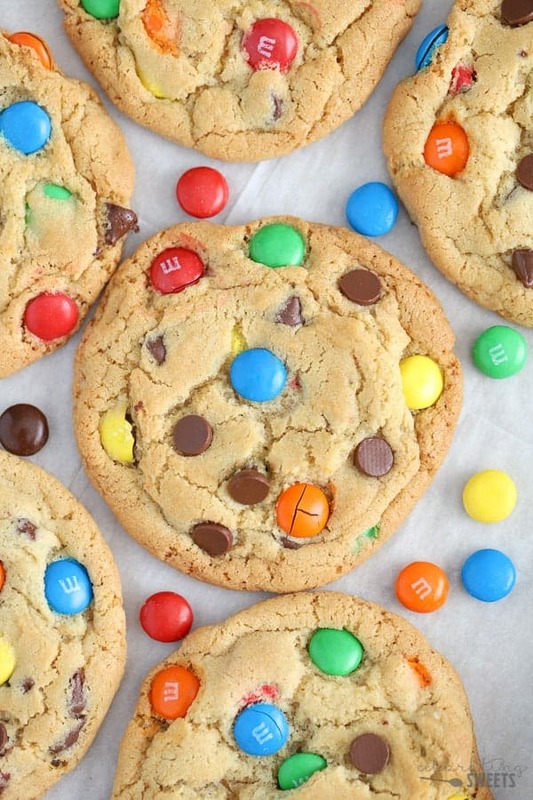 Follow these tips for making the tastiest M&M Cookies EVER! DO NOT OVER-BAKE! We want crisp edges and soft centers, so do not wait until these cookies look done to pull them from the oven. Remove them from the oven just prior to being done and then they will finish cooking as they cool on the baking sheet. 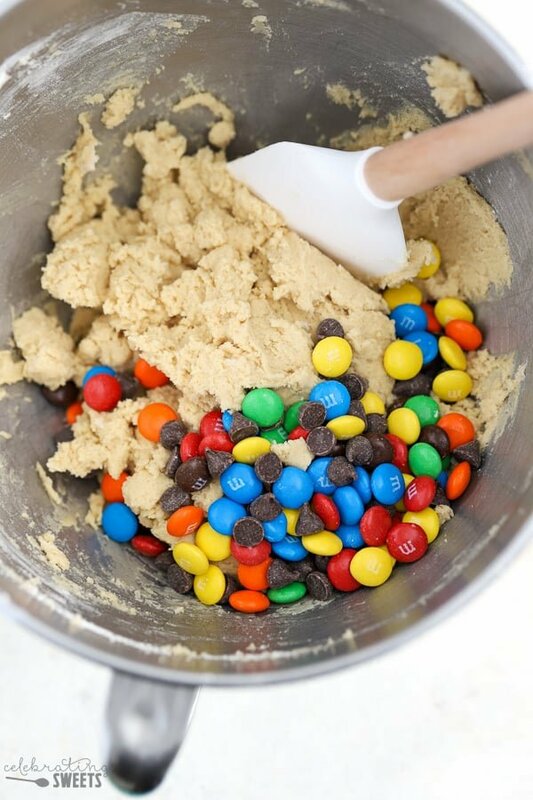 Mix some of the M&M’s into the batter and press the rest onto the tops of the cookies right before baking. 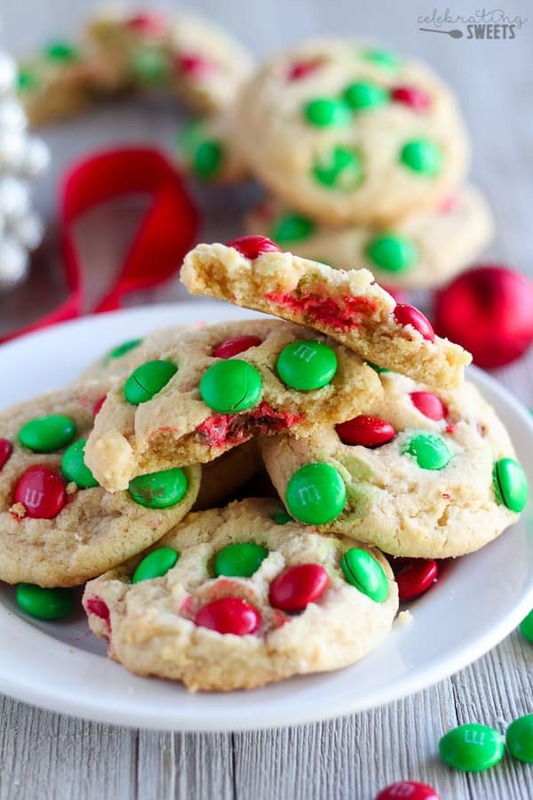 This allows the M&M’s to be more visible, adding a nice pop of color to the cookies. Be generous with the M&M’s that are going on top. As the cookies bake and spread out the candies will distribute throughout the top. Make sure your butter is softened but still cool to the touch. Using butter that is too soft will lead to cookies that spread to much in the oven. 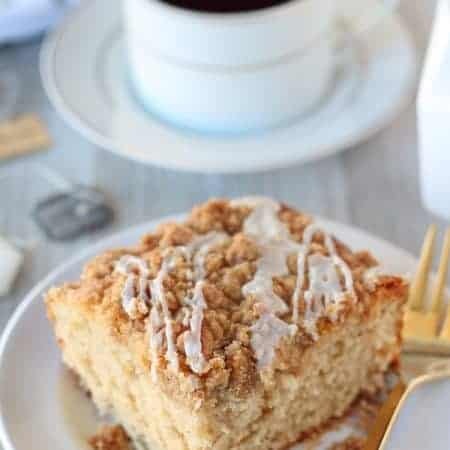 Your brown sugar should be soft and fresh. We’re relying on the moisture in the brown sugar to help make these cookies chewy. 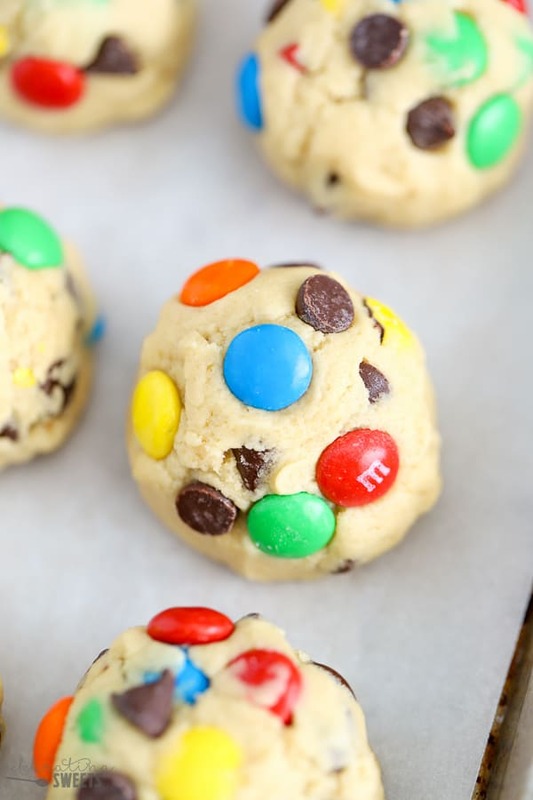 You can make these with regular M&M’s, holiday M&M’s or a combination of M&M’s and chocolate chips. How big you scoop your cookie dough affects whether your cookies come out thinner or thicker. You can see from my variety of photos that this dough can bake up either way. You can also bake a little longer than suggested for crispier cookies. 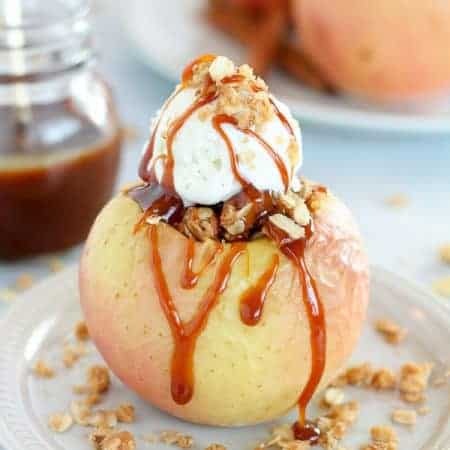 Play around with the recipe to create YOUR favorite version. Thick Cookies: Scoop generous portions of dough (2 tablespoons), a little larger than a golf ball. As these bake they will spread, but the center will stay thicker than the edges. Optional: when you remove them from the oven, gently press the edges of the cookie inward a little bit to help thicken them. Note: Want them even thicker/puffier? Refrigerate the dough for 30 minutes-1 hour before baking. Thin Cookies: Use a small portion of dough (1 to 1.5 tablespoons). As they bake they will spread a bit thinner than the larger dough balls. Tip: When pressing M&M’s and chocolate chips into the tops of your dough balls, do NOT press so hard that you flatten the dough balls. When they enter the oven they should still be ball shaped. Now what are you waiting for? Let’s satisfy those cookie cravings, people! Once you try these, you’ll reach for this recipe again and again. Happy baking! The BEST Soft and Chewy M&M Cookies. 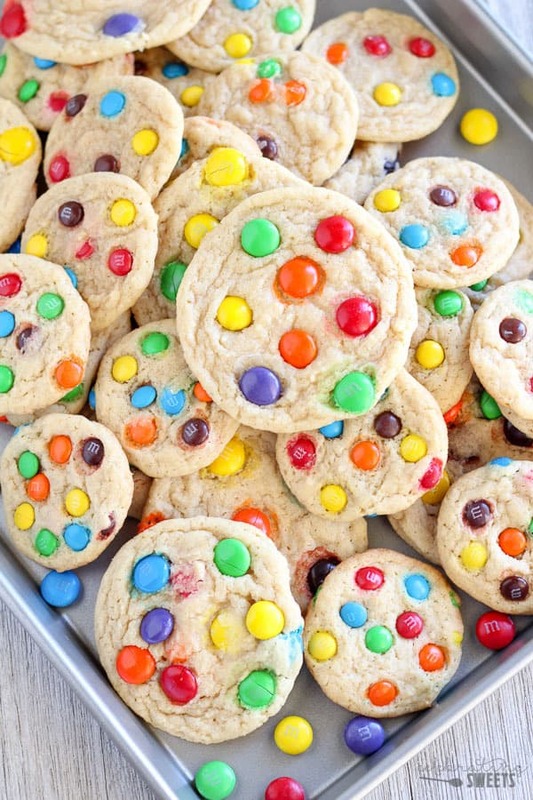 Crisp chewy edges, soft centers and loaded with colorful M&M's. Everyone goes crazy for these. Preheat oven to 350°F. Line two baking sheets with silicone mats or parchment paper. In a separate bowl, beat butter and both sugars for 2 minutes, until light and fluffy. Add egg and vanilla extract, mixing until combined, scraping the sides of the bowl as needed. On low speed, add in flour mixture and mix until just combined. 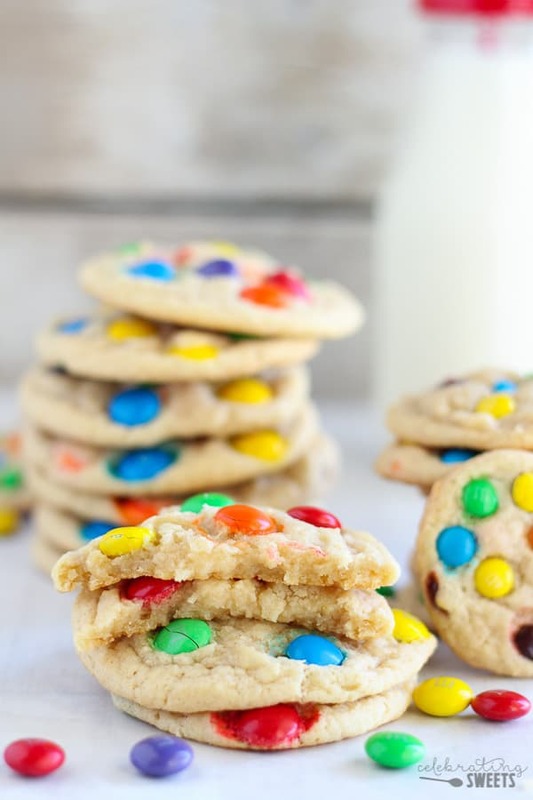 Gently stir in M&M's/chocolate chips - I usually add about 3/4 cup into the batter, the rest get pressed on top of the cookies before baking. Scoop balls of dough, between 1.5 and 2.5 tablespoon portions (a little smaller or a little larger than a golf ball). Drop dough onto prepared baking sheets leaving an inch or two for spreading. Using the remaining M&M's, press several (5 or so) onto the top of each mound of dough. Keep in mind that the cookies will spread out while baking, so be generous with the M&M's. Bake for 8-11 minutes (see note), until the edges of the cookies are set but the center is still slightly underdone , this will create a soft cookie. For a crispier cookie, continue baking for another minute two. Place the baking sheets on wire racks and allow the cookies to cool completely. They will firm up as they cool. Optional: for a slightly thicker cookie, you can gently press the edges of each cookie inward (just a bit!) while they are still warm. BAKING TIME: Adjust according to the size of dough balls. I just made these amazing oookies with the new Cheesecake M and M’s. My family has eaten most of them already. Pretty good but it seems like the proportions are off. The dough was extremely thick & I felt it needed more sugar. I made a double batch of dough with the single-batch amount of m&m’s plus probably 1/2 cup chocolate chips & it was way too much. I like a sweeter dough with fewer chunks, but that’s just me. They did bake up nice & soft though. My daughter’s preschool sent home a note saying they could bring valentine cards and a treat to school, which I interpreted to mean something like fun size M&M packs to go with the cards, so that’s what I bought. Then today we got a reminder email but after “treat” it said “such as cupcakes or muffins”. So we ripped open the fun size packs and made these cookies. They came out great and that’s with my 2.5 year-old and 13 month-old “helping” so you know not one darn thing was measured very accurately! Truly a fabulous recipe. Might be my favorite cookies! Sorry to hear that. Yes, too much flour will keep them from spreading. Did you follow the instructions in the note for properly measuring flour? I made these yesterday and they came out PERFECT. I doubled the recipe and only used 2 cups of m & m’s, which was plenty in the batch. The cookies were nice and fluffy, not flat. I got 42 good sized cookies from doubling the recipe. It’s so good I’m going to use this recipe for chocolate chip cookies next! I’m pretty experienced at baking and I followed your recipe really closely. The cookies looked nothing like the ones in your photos. They were not bad tasting cookies, I just cannot get them to look like the ones in the photo (the one with the m&m and chocolate chips) no matter what. Can you make an updated video where you show the process from start to finish? I would really love to know what I’m doing wrong. I take baking really seriously! haha. Hi, Susan. Many different factors can have an impact on the end result. How soft your butter is, how you measure the flour, the moisture content in your brown sugar, what you line the pan with, how big your dough balls are etc. What looks different about your cookies? In the photos with the M&M’s and chocolate chips I used dark brown sugar and I scooped the dough balls quite large (about 2-tablespoon portions). In the blog post I get into detail about thick vs thin cookies as well as tips for this specific recipe – you can try reading that to see if it helps you troubleshoot. Perfection, great recipe will be keeping it for sure. I thought the dough was Going to be too soft, because I had melted the butter for easy hand mixing, but they turned out great. I even lessened the sugar, using all Panela , sprouted whole spelt flour and Little Secrets chocolate candies and peanut butter filled ones. So amazing, thank you! I’m glad it worked out. Sounds delicious! Thanks for commenting. Enjoy!